Boston, MA (Jan. 31, 2019) – The reinsurance business faces numerous challenges, including years of soft market conditions followed by sudden, sharp hardening periods; tremendous losses from man-made and natural catastrophes; and open-ended liabilities such as asbestos and terrorism, requiring reinsurers to adapt and come up with creative solutions. In a new report, Business and Technology Trends: Reinsurance, research and advisory firm Novarica provides an overview of reinsurers’ business and technology issues, data about the marketplace, several examples of recent technology investments by reinsurers, and top technology priorities for 2019 and beyond. Business intelligence and modeling are critical. 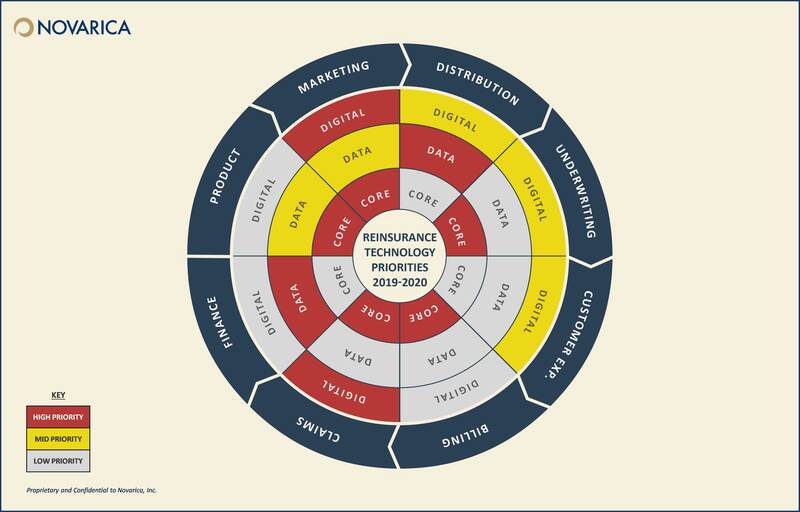 Data analysis is central to the reinsurance business. Pressure from competitors means moving from Excel-based analysis to more sophisticated technology. Larger reinsurers are investigating AI and machine learning. Reinsurers are replacing core systems. Reinsurers are centralizing business and dealing with an increase in audits and regulation, rather than a drive for modern technology. Alternative capital is providing stability. Despite expectations that investors would flee at the first significant cat activity, most are recapitalizing. The availability of capital is a factor in subdued rate increases. Facing pressures from a prolonged soft market followed by an erratic business cycle, reinsurers are focusing their technology strategies on attracting insurer clients and improving profitable decision-making, including core systems replacement and investments in business intelligence and modeling. At the same time, reinsurers are actively monitoring emerging technologies like blockchain. This report provides an overview of reinsurers’ business and technology issues, data about the marketplace, and several examples of recent technology investments by reinsurers. Recent market and financial trends. Technology issues, priorities, and examples by functional area.